You should think carefully about whether to attend for screening because it can lower your chances of dying from breast cancer. Making up your mind about whether to attend for screening can be a difficult decision. There are lots of facts you should be aware of before you decide. If you cannot decide what is right for you, we can help! Email us at breast.screening@hey.nhs.uk and we will get in touch with you as soon as possible. We will not try to persuade you to attend. We will help you make the decision that is right for you. You may find it useful to read all of this information before making a decision. Breast screening finds changes in the breast tissue before they can be seen or felt. This means that we can find cancers early, which gives us the best chance to treat them successfully. Cancers found on screening tend to be small and we can often remove them before they become too harmful. The NHS Breast Screening Programme saves around 1,400 lives in England every year. This is possible because screening finds cancers in their earliest stages. The World Health Organisation believes that 1 life is saved for every 500 women who are screened. 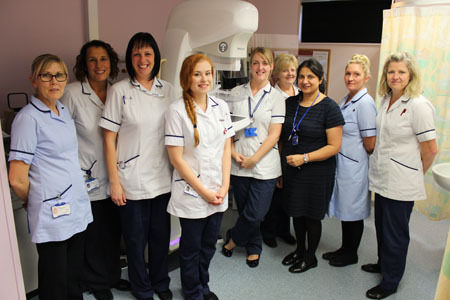 This means that the Humberside Breast Screening Service saves around 1 life every 2 days. Cancers found early can often be treated with minor surgery. This means that we can take out the cancer without having to remove the whole breast. If we find cancers later, we may have to completely remove one or both breasts to make sure that no cancer is left behind. When cancers are found early, we have the best chance to treat them successfully. Cancers in their early stages also often require less treatment, or more simple forms of treatment, than those in advanced stages. 24 out of 25 women who attend for screening are given the ‘all clear’. This means that their breast x-rays look completely normal. If you are given the ‘all clear’ you do not need to be screened again for another 3 years. A lot of women attend screening simply for peace of mind – to know that their x-rays are normal. Another way that breast screening gives women peace of mind is through finding problems early. Cancers found on screening tend to be small, meaning we can achieve the best possible results from treatment. The breast screening procedure takes around 6 minutes. Each breast is compressed for only a few seconds. Most women will spend no more than half an hour at the screening clinic. A lot of research has been done to find the best type of breast screening. Mammography is known to be very good at correctly identifying changes. Some studies have found mammography to be up to 95% accurate. Mammography is the most accurate test for finding breast cancers early. For every 100 women that we screen, 4 will need to come for extra tests at our assessment clinic. This is because their mammograms have shown something which might be abnormal. For most women (3 out of 4), the extra tests show that there is nothing to worry about. This is called a ‘false positive’ result. Coming to the assessment clinic and waiting for the results can be very scary. Some women are happy to have these extra tests done to make sure that they are healthy. Other women can feel upset about having had extra tests when there was actually nothing wrong with them. There are very few medical tests which are 100% accurate. Sometimes a breast screening x-ray will look normal even when a cancer is present. This is called a ‘false negative’ result. False negatives are extremely rare, but this is one of the reasons why breast awareness is so important for every woman — even those who have attended for breast screening. Sometimes breast screening will find a cancer in its very early stages, before it is dangerous. Some of these cancers will grow and become harmful, but others will stay small and never become dangerous. We are not able to tell which of these cancers will grow and which will not because the changes are so tiny. If your mammogram finds one of these cancers, we may offer you treatment to make sure there is no chance of the cancer becoming harmful. This means you could be treated for a cancer that would never have been dangerous to you. These cancers are found in around 1 woman out of every 1,000 we screen. Breast screening uses x-rays and all x-rays carry a small amount of radiation. The amount of radiation given during a screening mammogram is tiny, less than for a chest x-ray. In fact, you would take in more radiation by flying from England to Australia! It is very unlikely that the radiation from breast screening would cause any harm. The benefits of breast screening are greater than the risks from radiation. If you have been previously exposed to chest radiation in any setting (for example at work or through previous radiotherapy) you should consult a doctor to find out whether the screening x-rays might put you at increased risk. We regularly check all of our breast screening equipment to make sure that it is working well. This means that we are able to get very clear pictures while using a very low dose of radiation. Breast screening can cause anxiety for a number of reasons. Some women worry that the procedure will be uncomfortable or painful. Other women worry that they will get an abnormal result. Waiting for your results might make you very nervous. Being asked to go for extra tests can also be very scary. We understand this and will do everything we can to help you feel comfortable and reassured. If you have any concerns or would like some extra support, please contact us. The specialised x-ray machines we use hold your breasts tightly for a few seconds at a time. This gives us a clear picture and means that we only need to use a tiny amount of radiation. Many women find breast screening uncomfortable and some find it painful, but only for a few seconds. A recent study found that 50% of women did not find the procedure painful. Only 1% of women found breast screening very painful. The breast screening procedure takes around 6 minutes. Each breast is held in the machine for only a few seconds. The machine releases each breast automatically as soon as the x-ray has been taken. If you are worried about pain, it is safe to take painkillers before or after your appointment. You should take the same painkillers as you would normally use for a headache.